Q. Who pays for pilotage services in Canada? A. The ships do, they pay based on ship size, no tax dollars are involved. All serices inluding admistration are paid for by the ships. Q. What is the safety record of marine pilots? A. 100% incident free over the last 3 years in the Fraser River and an average of about 99.96% incident free over the last 20 years in the Fraser River. Of the very few incidents that have occured, none of them have resulted in death, pollution, serious injury or major damage . Accross Canada in 2015 the incident free rate for piloted vessels was 99.94%. Q. Who do pilots work for? A. Pilots answer to the Minister of Transport through the Pacific Pilotage Authority. We are not beholden to commercial or economic interests. As a single service provider, similar to Coast Guard, fire and police, we don't compete for pilotage assignemnts. Q. What is the largest size ship that can transit the Fraser River? ​The possible removal of the George Massey tunell will not significantly change this size, there are many other natural and man made barriers to increasing ship size. Q. How do you become a pilot? A. It is a prerequisite that all pilots are licensed Captains with extensive sea time in the particular pilotage region as well as passing a medical exam. If the prerequisites are met a canidate will sit through a series of written and oral examinations, if successful he/she will be placed on an eligibility list for selection to meet manpower needs. Once selected there is a long apprenticeship period that also includes sophisticated training such as Full- Mission Bridge simulations as well as hands on experience. Q. Once a pilot is licensed can he/she pilot any ship? A. No, the pilot will be limited to a certain size ship and then each year cleared to move up to bigger ships. 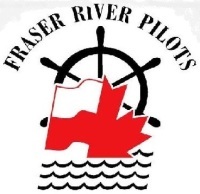 It can take about 5 years to become unlimited in the Fraser River Pilotage district. Q. Who is in charge of the ship the Captain or the pilot? A. In Canada the pilot is legaly in charge of the navigation of the ship. The pilot has the "con"
Q. Do all ships have to take a pilot every time they come to the west coast of Canada? A. All large cargo ships such as containerships, grainships, tankers and cruise ships etc. must have a pilot for every transit throughout the inland waterways of British Columbia, including repeat visits. Q. How do ships compare to other modes of transort for carbon emmisions? A. Because ships are very large relative to the ports and all ports are very different from one another, as are the ships and therefore require a local area expert. Airplanes on the other hand are much more stanadardized as well as the airports, with much more air space to manouvre in.